When Uncle Larry was in his early 20’s, he lived with a girl in Hawaii and they had a cook (Japanese) and before he left, she gave him these recipes. I never knew this about my uncle, and once again I was reminded that most people have lived lives beyond the ones we know. Before we became stable, upstanding citizens and parents, many of us had quite an interesting and colorful past. Myself included. But those are tales for another day. I always knew my uncle was a great cook, because my mother raved for years about how he cooked dinner for her and my aunt after my cousin was born and my mom was sent up to New Hampshire to help out with the new baby duties. Of course, Mom’s standards — no offense, Dad — were pretty low, and I’m sure anything beyond a bowl of cereal and milk was mighty impressive to her. Anyway, the surprise to me was not that my uncle (or any man) can cook, but that he lived in Hawaii. I have a bit of a Hawaii fixation, and we will definitely be discussing that another day. I am always so honored when people take the time to share their favorite recipes with me, and I promise you I will eventually try them all. In April, I will be making a coconut cake from one of my mom’s oldest friends. 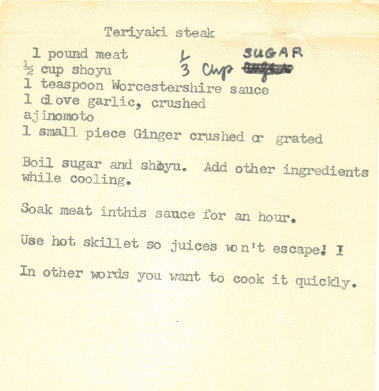 But tonight, it is Uncle Larry’s Teriyaki Steak from 1970’s Hawaii. It is a simple little recipe, but as we all know, simple things are often the most delicious. I served this tonight with sauteed green peppers, onions and rice. The verdict was strongly positive. Logan, 15, said it was as good as expected. Andrew, 8, and my pickiest eater in the family, said it was BETTER than he expected. Nate liked it well enough, and Ed is already asking when I can make it again. In this family, that’s a win. “Shoyu” means soy sauce. “Ajinomoto” is the commercial name for mono-sodium glutamate, or MSG as it’s commonly known, and we will NOT be using that, even sparingly. But in the interest of authenticity, I am including it in the recipe. I actually made two batches of this marinade: one for the peppers and onions, and one for the steak. I wanted to be able to pour some extra over the rice, and of course we know that any extra beef marinade must be discarded for safety reasons. I used about a pound and a half of a boneless top round sirloin. I also sprinkled some roasted sesames on my serving, because I believe almost everything is better with sesame seeds. 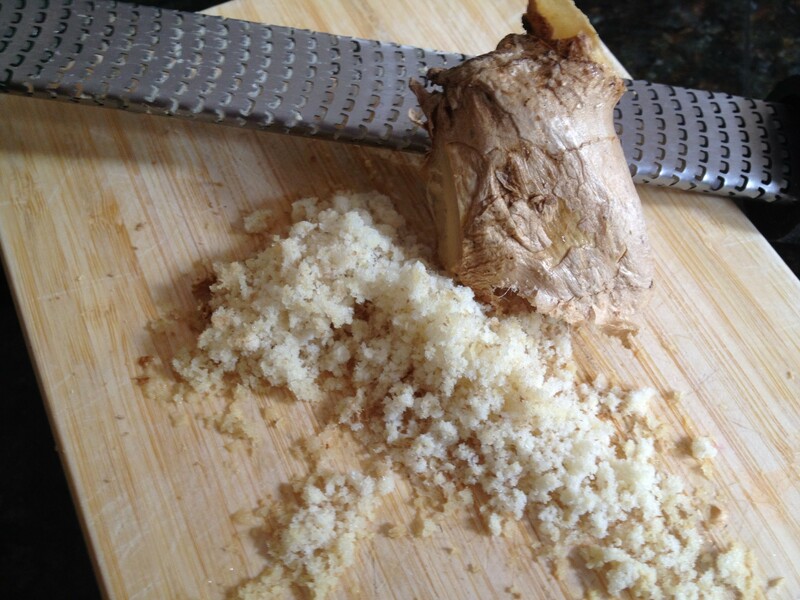 Grating fresh ginger is a breeze if you freeze it first. Even peeling is unnecessary. A Microplane grater/zester makes the job effortless. Say goodbye to bloody knuckles forever! Boil sugar and soy sauce. Add other ingredients while cooling. 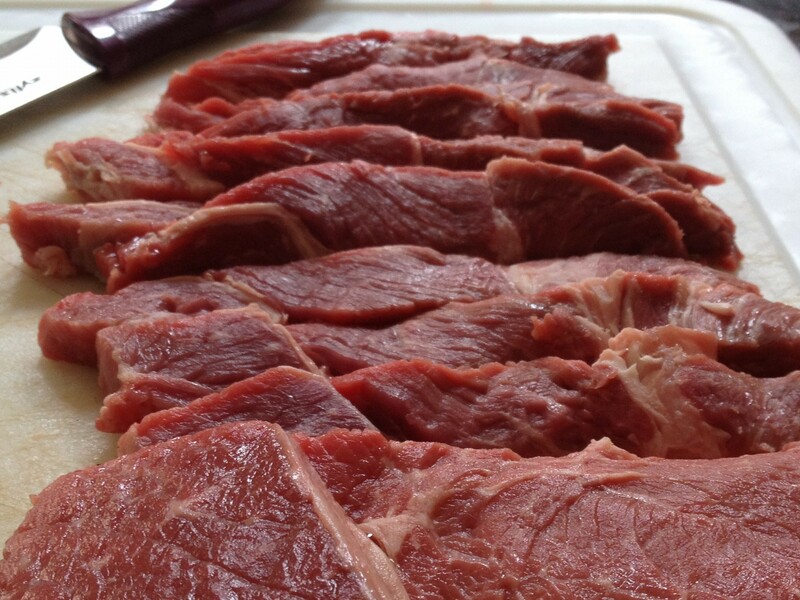 Soak meat in this sauce for an hour. (Dawn used a Ziplock bag and marinated for about two hours). Use hot skillet and cook quickly (Dawn used some olive oil in the skillet, too). The original recipe is shown below, and I just love that it was kept for all these years. I hope you enjoy this as much as my family did. 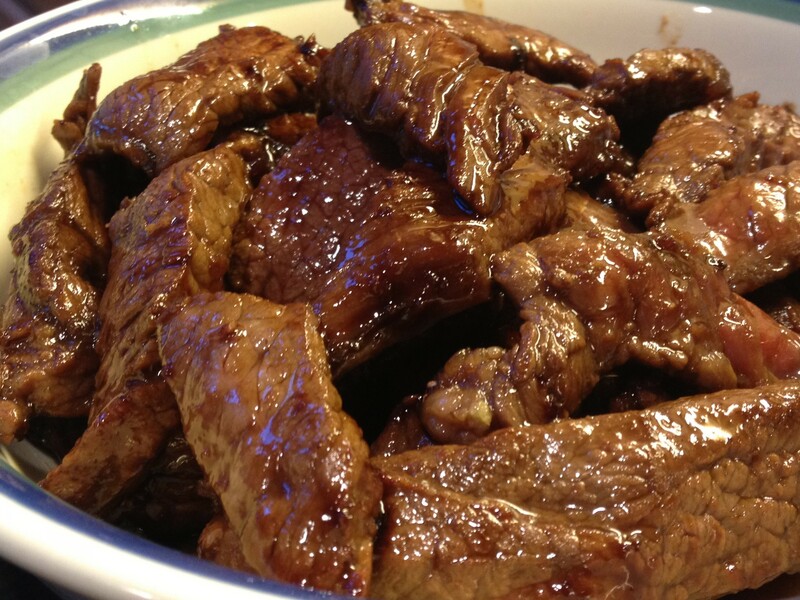 This entry was posted in Main Dish and tagged 1970s food, beef teriyaki, Hawaii, Japanese steak, soy marinade, teriyaki steak, top round sirloin by Mom Mom's Apron. Bookmark the permalink.